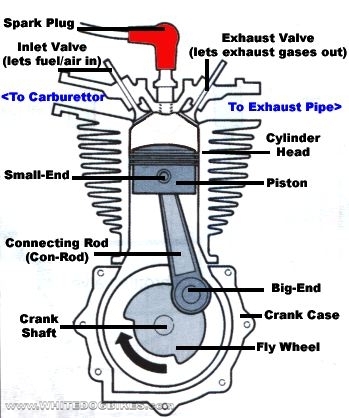 Please note-the diagram below represents a very simple version of a 4 stroke motorcycle engine, in reality, they are a little bit more complicated!!! 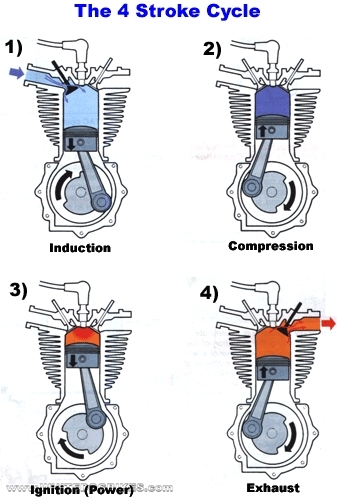 Compression: As the piston travels up to the top of the cylinder head, it ‘compresses’ the fuel/air mixture from the carburettor in the top of the cylinder head, making the fuel/air mix ready for ignighting by the spark plug. This is known as ‘Compression’. Iginition: When the spark plug ignites the compressed fuel/air mixture, sometimes reffered to as the power stroke. Exhaust: As the piston returns back to the top of the cylinder head after the fuel/air mix has been ignited, the piston pushes the burnt ‘exhaust’ gases out of the cylinder & through the exhaust system. We have simplified this explanation as much as possible so some of the ‘correct’ terms have been replaced. There are many more factors which enable an engine to run, such as fuel/air ratios, ignition timing & shaped piston heads (extensively used in 2 stroke engines) but the explanation below outlines the basic differences between 2 & 4 stroke engine operation.